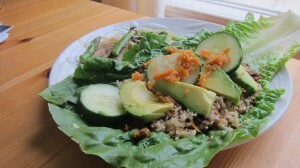 Anyone who knows me, knows how much I love a good lettuce wrap. I love the crisp and crunch of the lettuce mixed with the warm deliciousness of a veggie filled mixture. And then there’s the sauces – oh, the possibilities! After a long run on the trails near Pt. Reyes, I decided it was time for some lettuce wraps and noodles. It ended up being the PERFECT way to fuel up after a long, tough run. And the best part was, it was also so very easy to make. Heat olive oil in a pan. Add mushrooms and saute for 2-3 minutes or until tender. Turn down the heat and add the crumbled Sunshine Burger patties and cook for another minute or so. Remove from heat and place mixture on the romaine. Add in the quinoa / brown rice. Top with avocado, slices, shredded carrots, and cucumbers. Add sprouts and drizzle on sauce of your choice. For the noodles, I simply soaked the rice noodles for about 5 minutes in hot water and mixed in some sauteed asparagus and mushrooms. I added in a very made up sweet and sour type sauce (totally delicious!) which consisted of brown rice vinegar, soy sauce, agave syrup, and a dollop of Hoison Sauce. This entry was posted in Dinner Recipes, Gluten-free Recipes, Recipes, Sunshine Burger recipes, Vegan Recipes, Vegetarian Recipes and tagged dairy free, fitness, gluten-free, good for you, greens, health, healthy, kale wraps, leafy greens, lettuce wraps, soy free, Vegan burgers, Vegan Recipes, vegetarian. Bookmark the permalink.